Arrival. Tribes arrive by truck (Brawn), boat (Beauty) and helicopter (Brains). They must pick leaders (Sarah, LJ, David), who then must choose the 'weakest.' Sarah picks Trish, LJ picks Morgan, David picks Garrett. 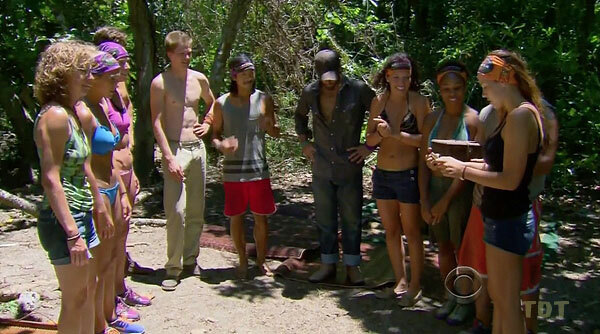 Weakest are flown back to camp, where they choose between idol clue versus more rice for their tribe. Arrival. Tribes pick leaders, send "weakest" to camp. Ep1 Brains idol: Garrett opts to look for an idol instead of take extra rice. After hunting for a while, he finds it. Draggin' the Dragon. Tribes must assemble a cart, put three chests on it, retrieve 3 keys, unlock the chests, disassemble the carts and pass everything through/over an obstacle, reassemble the cart, then open the chests to complete a three-stage puzzle. 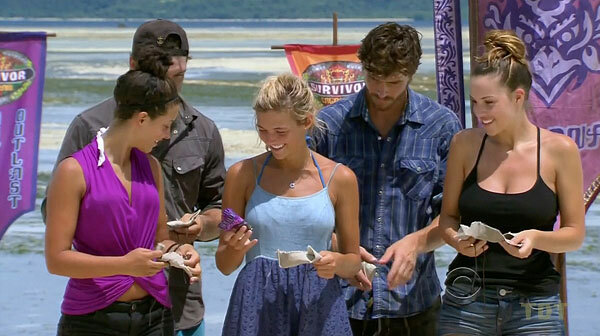 LJ & Alexis do the puzzle for Solana/Beauty, which wins immunity plus a fire-making kit. Lindsey & Sarah do it for Aparri/Brawn, which is second, and gets immunity plus flint. Luzon/Brains lags on the first part, and Tasha & Kass are unable to catch up on the puzzle. Ep1 RC/IC: "Draggin' the Dragon" - Solana wins, Aparri second. Ep2: "Hot Girl With a Grudge" (part 2) Ep3: "Cops-R-Us" Ep4: "Our Time to Shine"
Phish Farm. Brice, Cliff sit out. Tribes must swim out to a cage, climb over and into it, untie a gate, then pull a set of heavy fish traps back to the beach. Once back, one person (Sarah, LJ, J'Tia) solves a rotating puzzle. Despite a huge Brains lead heading into the puzzle stage, Brawn wins, and Beauty is second. Brawn wins lots of fishing gear, Beauty slightly less fishing gear (both plus immunity). Ep2 RC/IC: "Phish Farm" - Aparri wins, Solana second. Ep2 Brawn idol: Tony looks for and finds Aparri's idol clue in the reward. He immediately looks in the right place and finds it. Ep3 Idol. LJ uses his tribe's sitting in the shelter during the storm as cover for looking for Solana's idol. After searching the rocks where the tribe found Morgan, he soon finds the idol. LJ finds Solana's idol, without a clue. Mazed and Confused. Alexis, Jefra; Tony, Lindsey sit out. Tribes form a four-person bucket-tossing line to deliver water to a bucket on a teeter-totter. Once enough water has been collected, the seesaw drops, releasing a ball. The ball is then placed in a spinning vertical maze, to be pulled in either direction by two people (Woo,Cliff; LJ,Jeremiah; Kass,Spencer). Brawn finishes first, winning a tarp, hammock, and comfort items. Brains finish second, winning a tarp (and immunity). Ep3 RC/IC: "Mazed and Confused" - Aparri wins, Luzon second. Haulin' Oats. Woo, Sarah; Morgan sit out. 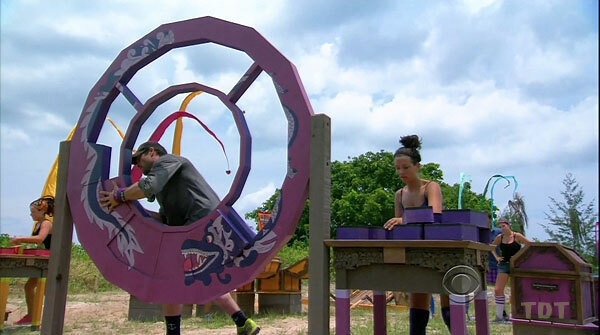 Each tribe has a caller (Tasha, Alexis, Cliff) directing a pair of blindfolded tribemates to collect five items, followed by a tribe flag. A third blindfolded tribemate helps raise the collected items on a ropes & pulley platform, up to the caller. Beauty wins a coop with three chickens. Brawn pulls ahead of a bumbling Brains tribe on the last item, and wins a dozen eggs. Ep4 RC: "Haulin' Oats" - Solana wins chickens, Aparri second. Octopus' Garden. Lindsey, Tony; Alexis sit out. Tribes must dive down and collect five buoys tied to a rope at 3-foot intervals (3,6,9,12,15 feet down). Then they must shoot the buoys into a floating basket. 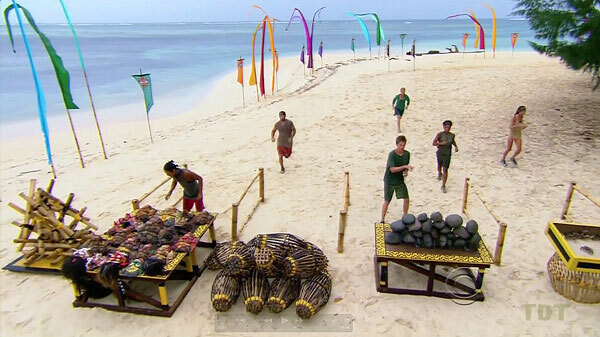 Jeremiah shoots Beauty to a win before either other tribe has finished retrieving buoys. Cliff shoots for Brawn, overcoming an attempt by Sarah and Trish to throw the challenge. Despite solid shooting by Spencer, Brains lose again. Ep4 IC: "Octopus' Garden" - Solana wins, Aparri second. TC4 - J'Tia voted off (3-1), 14 left. Ep5: "Odd One Out" Ep6: "We Found Our Zombies" Ep7: "Head of the Snake"
The three tribes draw wrapped buffs from a single basket. New Solana: Tony, Trish, Cliff, Woo, Lindsey, LJ, Jefra. New Aparri: Sarah, Kass, Tasha, Spencer, Alexis, Morgan, and Jeremiah. Kicking and Screaming. Woo, Kass are not officially sitting out, but do not participate. 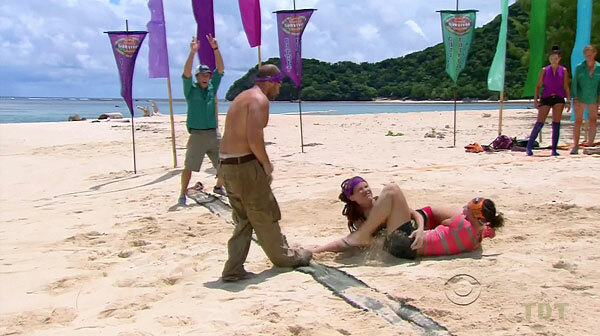 Two tribe members must attempt to pull a member of the opposing tribe off a pole, then drag them through the sand to the finishing mat. Rd1: Sarah & Morgan beat Lindsey. Rd2: LJ & Trish easily beat Alexis. Rd3: Tony & Lindsey beat Sarah. New Solana wins, 2-1, and gets donuts, coffee and cookies. Gate Crasher. Morgan, Trish sit out. Six tribe members must carry a log and use it to smash through three barriers. Once through the barriers, the log is used to complete a maze, using grooves in the log. Aparri is the first to complete the maze and ring a gong with the log, winning immunity. Ep5 IC: "Gate Crasher" - Aparri wins. TC5 - Cliff voted off (4-3), 13 left. [Ep6] Lindsey quits, 12 left. Idol Hands. Alexis, Kass sit out. 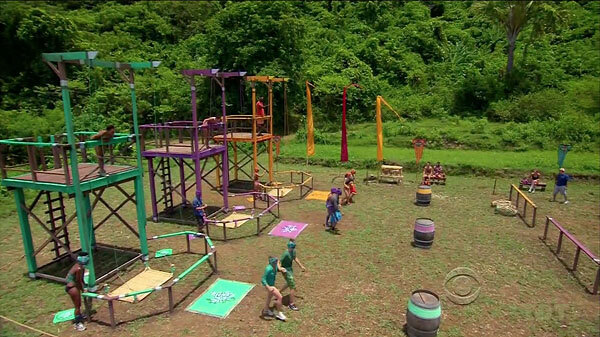 One at a time, contestants face off against an opponent from the other tribe, trying to knock an idol off of a hand-held platform, while not dropping their own. Spencer d. Woo; Trish d. Tasha; Sarah d. Jefra; LJ d. Jeremiah; Tony d. Morgan; Woo d. Spencer. Solana wins, 4-2, gets to pick two people (Tony, Woo) to raid Aparri's camp. Styx. Morgan, Tasha sit out. Five tribe members must order poles to build a staircase, cross a multi-level obstacle, then one member (Tony, Jeremiah) must retrieve a key, unlock a machete, then chop through a log to release puzzle pieces. Two members (LJ, Woo; Sarah, Spencer) then complete a puzzle that shows a 3-number combination. The combination releases a flag. LJ and Woo speed through the puzzle, and Solana wins. Ep6 IC: "Styx" - Solana wins. TC6 - Alexis voted off (6-1), 11 left. Ep7 merge: The New Solana tribe is sent to New Aparri's camp, where the merge occurs. Feast items and new black buffs are handed out. Someone picks the name 'Solarrion,' because everyone had too much rum. Ep7: "Head of the Snake" Ep8: "Mad Treasure Hunt" Ep9: "Bag of Tricks"
Bermuda Triangles. 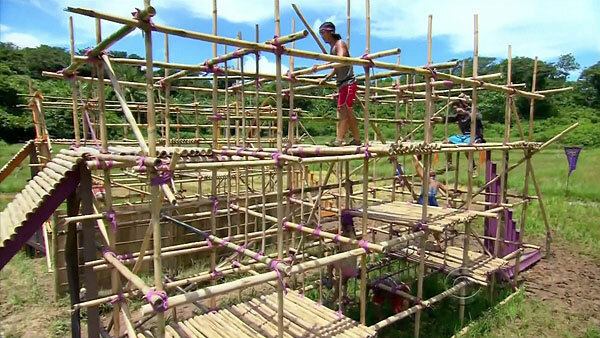 As in Caramoan, contestants must balance on pyramidal structures in the water, progressing through two 15-minute rounds on lower rungs, then a final round on the top rail. Last one standing wins. All survive the first two rounds, then a swath of contestants fail to make the transition to the third round. 11.Spencer, 10.Kass, 9.LJ, 8.Sarah, 7.Jefra, 6.Tasha, 5.Trish, 4.Jeremiah. Morgan lasts a few seconds in round three, leaving Tony vs. Woo. 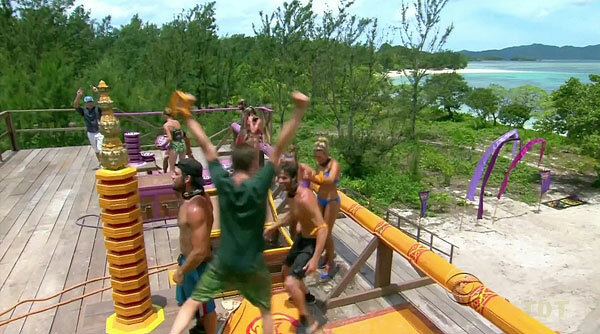 Woo wins immunity. Ep7 IC: "Bermuda Triangles" - Woo wins. TC7 - Sarah voted off (6-5), 10 left. Rise and Shine. 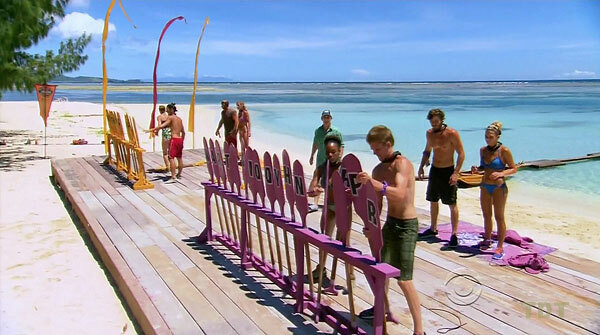 Randomly-selected groups of five race over a net see-saw, across floating balance beams, then untie and move a chest up the beach to a tall structure. After hauling the chest up the structure, two people (Woo&Kass, LJ&Spencer) must finish a tower puzzle, topping it with a piece from the chest. Orange group (LJ, Spencer, Jefra, Jeremiah, Morgan) wins. Reward is a trip to a pop-up Outback Steakhouse. Ep8 RC: "Rise and Shine" - Spencer, LJ, Jefra, Jeremiah, & Morgan win. Ep8 Idol. After finding a clue in his reward napkin, Spencer starts looking for an idol. Woo follows him, steals the clue, then runs back to camp to share it with his alliance. 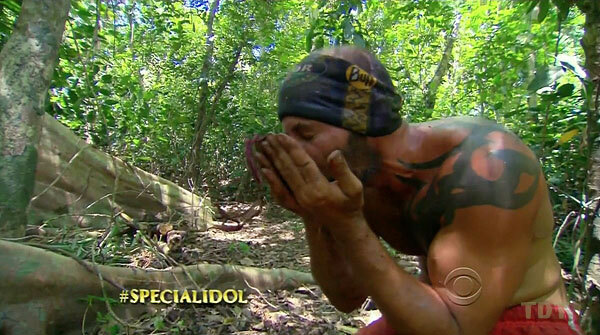 Despite the entire tribe now looking for the idol, Spencer still finds it, undetected. It turns out to be just a regular hidden idol. Keep On Your Toes. 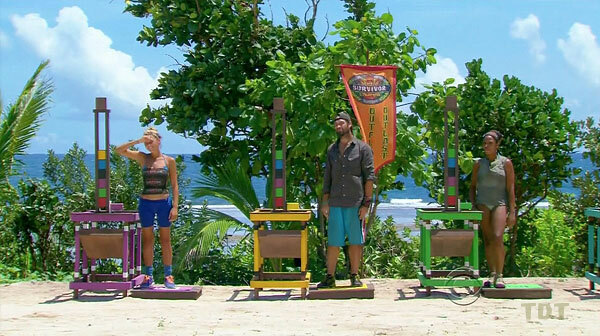 Contestants must stand on tiptoes to keep pressue on a block of wood wedged between their head and the surrounding wooden frame they're standing on. 9.Kass is out first, then 8.Trish, 7.Tony. At 25-min mark, 6.Morgan, 5.Woo are out. At 1 hr, 4.Jefra and 3.LJ drop. Finally, at 90 minutes, 2.Tasha is out, and 1.Spencer wins. Ep8 IC: "Keep On Your Toes" - Spencer wins. Supertramp. Randomly split teams of three must use a grappling ball(!) to release 20 sandbags. Then they throw/move the sandbags through a net tunnel, then bounce sandbags off a trampoline and land them in one of five nets. The team of Tony, Spencer, and Jeremiah wins a spa trip with food, a shower, and massages. 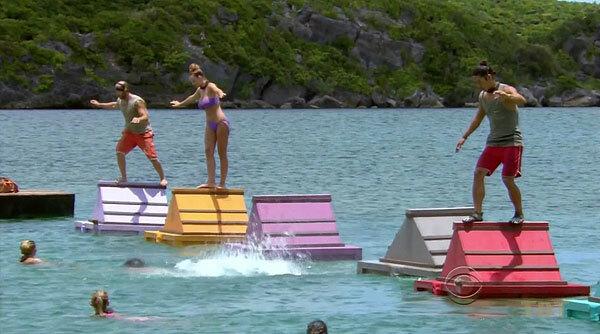 Ep9 RC: "Supertramp" - Tony, Spencer, and Jeremiah win spa trip. Living Color. 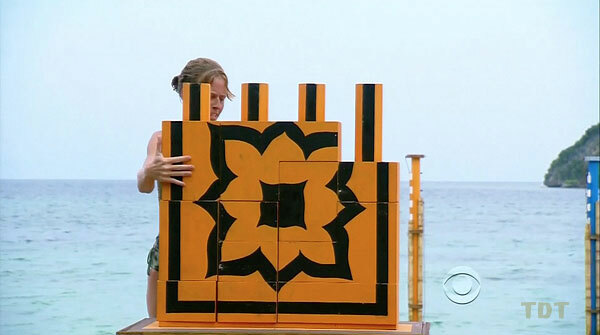 Jeff Probst shows a series of colored tiles to the contestants, and they must repeat the sequence back to him by dropping tiles into a vertical stack, one at a time. Anyone making an incorrect choice is eliminated. In round 1 (four tiles), 9.Trish (2nd tile) and 8.Woo (3rd tile) are out. In round 2 (seven tiles), (tie-4th)Jeremiah, Jefra, Kass Spencer are all out on the 6th tile, and (tie-2nd) Tony and LJ are out on the 7th tile. Tasha wins. Ep9 IC: "Living Color" - Tasha wins. TC9 - L.J. voted off (5-3-1), 8 left. Ep10: "Sitting in My Spy Shack" Ep11: "Chaos Is My Friend" Ep12: "Havoc to Wreak"
Rove, Rove, Rove Your Boat. Contestants compete in 2 groups of four (Tony,Trish,Kass,Woo vs. Spencer,Tasha,Jeremiah,Jefra). They must row out past a buoy, then return to shore, collecting paddles. The paddles have letters on them, and must be arranged to spell a 3-word phrase ('WORTH PLAYING FOR'). Spencer & Tasha ace the puzzle, winning their team barbeque and letters from home at a waterfall cave. Hard to Handle. Contestants must balance a ball on an elevated plate for 10-minutes per round, while balancing on a narrow platform. Each round, the pole gets longer and the platform gets narrower. Rd1 (10min) 8.Jefra, 7.Trish, 6.Tony, 5.Kass are all out, all within the first 3 min. Rd2 (10min) 4.Jeremiah drops out. Rd3: 3.Woo is out first, then 2.Spencer, 1.Tasha wins! Ep10 IC: "Hard to Handle" - Tasha wins. 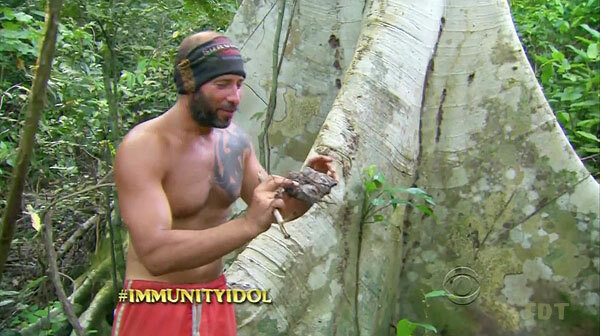 Ep10 Idol: Tony digs around a bunch of trees, and finds the special idol, just when he needs it. This was huge. Auction: Highlights include Trish ($80 for popcorn, candy, soda then a second purchase of rice); Jefra ($100 for quesadilla, guac, margarita); Kass ($20 for steak sandwich, iced tea); Woo ($40 for ribs & beer). Tasha, Spencer, Tony hold out for advantage. Tony & Spencer bid maximum $500 for it, draw rocks, and Tony pulls the winning black rock, winning what ends up being directions to a regular hidden immunity idol. Tasha ends up not spending any money, as no advantage in the IC is offered. Ep11 non-RC: "Auction" - everyone wins. Except Spencer. 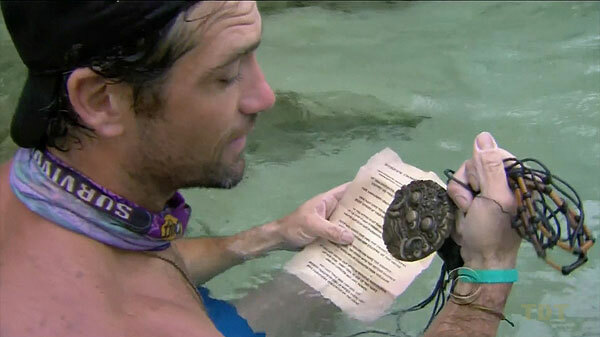 Ep11 Idol: From his auction purchase, Tony gets pretty complete instructions to finding yet another (regular) hidden immunity idol. He shows it to his alliance members to keep them loyal. Inside Track. 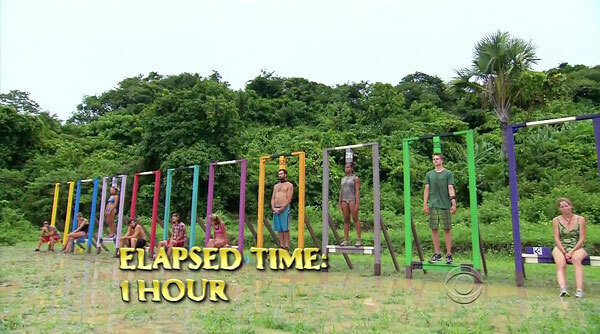 Contestants must dig in a small area to find the end of a rope. Pulling the rope reveals five bags containing balls. 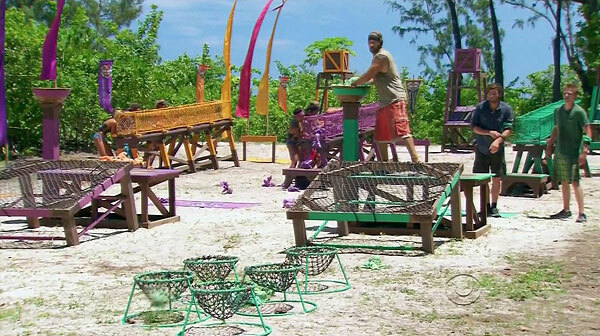 Contestants must untie the bags, remove the balls, then move all five balls to the end of a zigzag table maze. Tasha narrowly beats Woo (5-4), Tony & Spencer have 1, Jefra has 0, Trish & Kass are still untying bags. Ep11 IC: "Inside Track" - Tasha wins. Challenge Pitch. 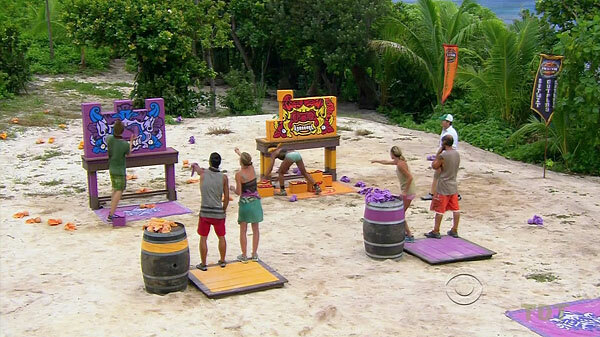 Contestants are divided into two teams of three. 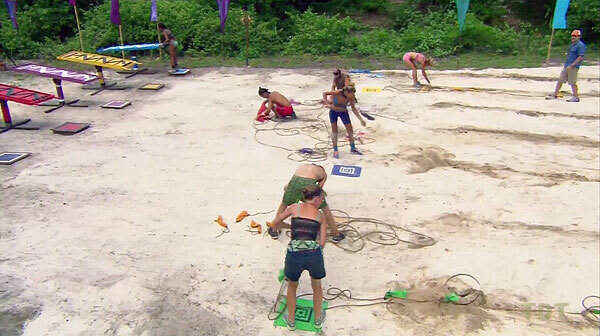 In the first part, they take turns throwing sandbags at the other team's 25-piece piece puzzle. Once the first team has knocked all the pieces off (Kass, Woo, Spencer), one person (Spencer, Tasha) must complete their team's puzzle. Kass, Spencer & Woo win hot dogs, hamburgers, and a trip to a local school to deliver school supplies, where Woo becomes an entertainer. Combo Platter. Contestants must race around a corner, memorize the number of six items (fish traps, rocks, crabs, masks, bamboo, buoys), then race back and enter those numbers in a combination lock. Correctly counting all six releases a bar to smash a tile. 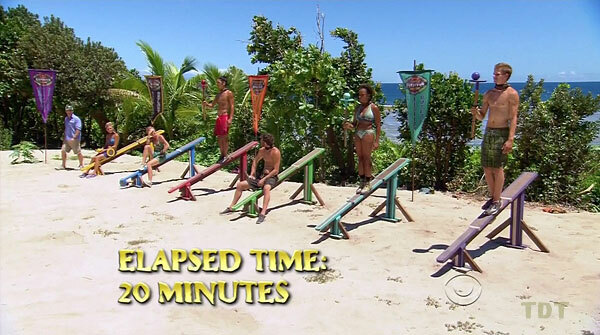 If a contestant guesses incorrectly, they must race back before re-trying. After more than 25 minutes, Spencer eventually wins. Tasha had one number wrong. Ep12 IC: "Combo Platter" - Spencer wins. TC13 - Tasha voted off (4-1-1), 5 left. Mud Run. 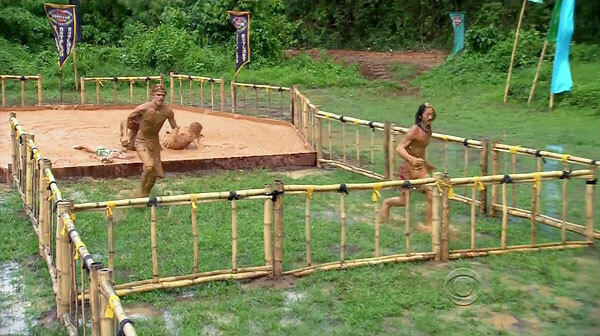 Contestants must race over a gate, into a mud pit, and back to the starting line, to fill a bucket with mud they scrape off of their body. Tony wins pizza delivered to camp, with a bucket overflowing with mud. Spencer and Woo are second and third, Kass and Trish last. Tony selects Trish to join him for the reward. Jacob's Ladder. 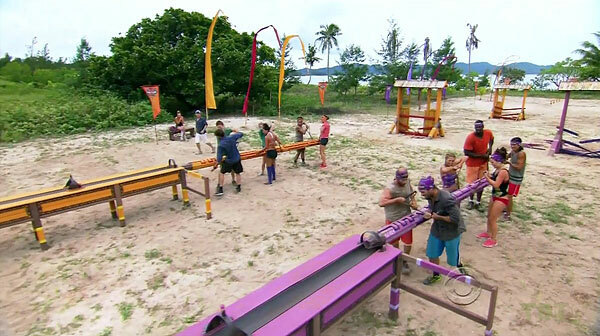 Contestants must work a slide puzzle to untangle ropes, releasing a key. The key unlocks a chest containing steps for a ladder puzzle. After completing a second ladder puzzle, contestants must solve a slide puzzle. 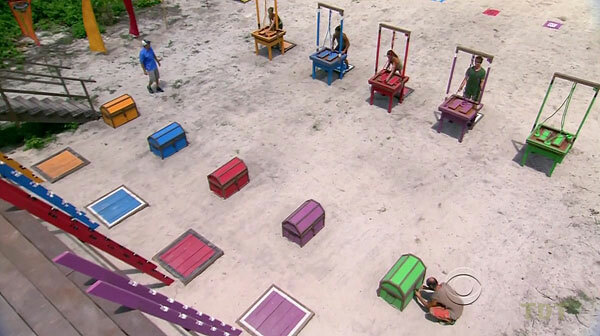 Tony blows a huge lead on the final puzzle, and Spencer wins immunity. Ep13 IC: "Jacob's Ladder" - Spencer wins. Vertigo. Loved ones observing from the shore. Contestants must must stand atop tall poles over the water, drop a rope-and-bucket into the water, and use the water to fill a tube, raising a key. Once the key has been retrieved, they go to shore to unlock the pieces of a complicated vertical puzzle. Despite a huge early deficit, Kass comes from behind to win on the puzzle stage. Ep14 F4 IC: "Vertigo" - Kass wins. TC15 - Spencer voted off (3-1), 3 left. Roundabout. 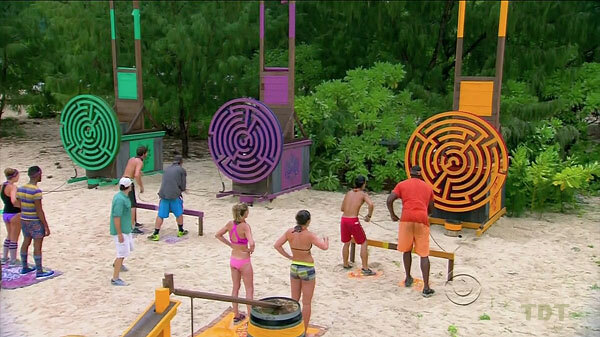 Contestants must race through a maze with turnstiles (only some of which turn), to retrieve four medallions. The medallions open a chest, which contains cogs for a gear puzzle that, when complete, raises a flag. 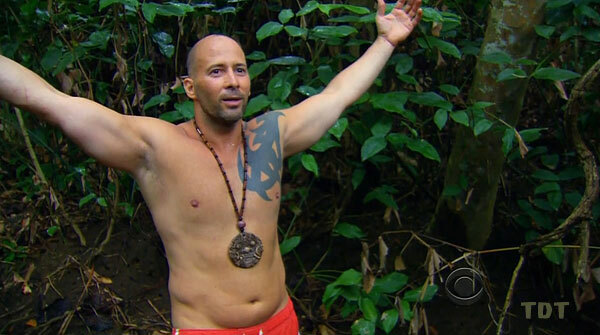 Woo and Kass both have their final pieces of the puzzle complete, but Woo has a slight lead, and wins immunity. Ep14 F3 IC: "Roundabout" - Woo wins. 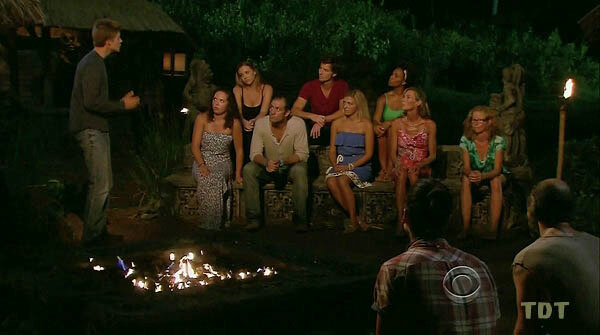 Final Tribal Council. Tony and WOo face the jury. Several jurors angrily question Tony, who largely stays silent, while Woo presents a solid case. Despite all that, every juror but Tasha ends up voting for Tony, who wins the million dollars and title of Sole Survivor, 8-1. Final Tribal Council and jury vote on the Final Two. Tony wins, 8-1. Contestants arrive back home; inevitable facebook/ twitter activity resumes.